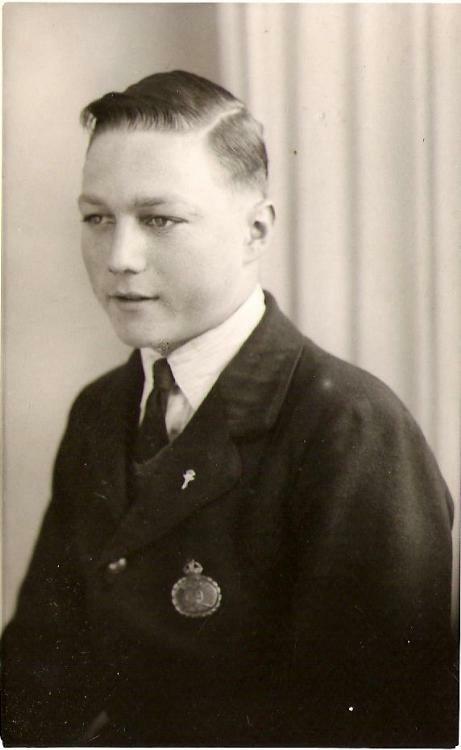 Harry 1942, dressed in his Messenger Boy uniform. The number on the breast badge is T49. Harry Bennett began his forty-five year career in the General Post Office (GPO) in April 1940, just prior to the Dunkirk evacuation. As a 14 year old Messenger Boy based at the Brighton area Telegraphists’ headquarters in Ship Street, his starting wage was 12/6d (approximately 62p). Delivering telegrams in wartime, he was often the unwelcome bearer of bad news – “lost, presumed dead”. A Messenger Boy waited at the door whilst the telegram was read in case the recipient wished to reply. Thus occasionally a recipient of bad news vented their initial shock and grief by screaming abuse at the boy. Failure to carry out delivery duties effectively resulted in additional unpaid work, known as “turkey”. Does anyone know the derivation of this term?! From 1942 to 1944 – the year Harry was called up for war service – he graduated to motorcycle work. This attracted an additional 9d per week. It also gave him time to ride home to lunch in Ashford Road, parking his machine discreetly off-road – as required by his employer – amongst the milk floats belonging to Ernie Dawes’ dairy. However, this arrangement was short-lived for, even though the Messenger Boys were required to deliver telegrams near their homes at lunchtime, a neighbour complained that this journey constituted a waste of war-rationed petrol. Demobbed in 1947, Harry was allowed a week’s rehabilitation. He then commenced work as a Postman. He was now based at North Road, in the building constructed on the site of the Regent Foundry in 1926 – currently the Brighton Area Delivery and Sorting Office. The basement contained stores, and a generator in case of power cut. Local mail was sorted on the ground floor. On the first floor, non-local mail was sorted with the help of the Transorma, a machine uniquely held by Brighton GPO, having been imported from Holland before the War. The canteen was on the second floor. According to Harry, some staff enjoyed alcoholic beverages with their meals but, thanks to a high density of pubs in the locality plus a thriving social club for GPO workers in Church Street, the sale of alcohol was soon deemed unnecessary. The Telephone Exchange occupied the third and fourth floors. A Postman could request a change of ‘walk’ when a vacancy occurred, these being allocated in order of seniority. New walks often resulted from a “revision” – a reorganisation of routes following, for example, the building of a significant number of new houses in an area. In 1949, Harry became a Postman Higher Grade. Based in the Sorting Outward section at North Road, this promotion meant the end of outdoor delivery work. 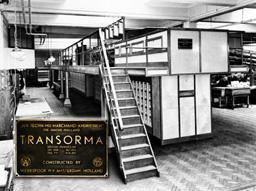 Following a stint at “floor duties”, he was selected for training on the Transorma. This demanded the ability to translate each of the country’s 324 counties and principal towns into a unique numerical code, as well as a working knowledge of any smaller towns and villages subsumed thereunder. Although the Transorma had spring-loaded carriages which opened fifty times a minute to receive mail, operators rarely achieved such high productivity. As both accuracy and speed were required, around thirty letters per minute was a more realistic norm. Harry became an Assistant Inspector in 1953. In this new role, he noted the irony of reprimanding lower grade staff “when a fortnight ago you were doing the self-same thing!” He was also now supervising his Postman father, who always eschewed promotion. In 1969, the year the GPO was nationalised, Harry Bennett became Senior Inspector. Whilst as an Assistant Inspector, he had paced the streets himself to time delivery walks for ordered revisions, he now initiated such revisions. Twelve years later, he became the Senior Inspector, a post he held until retirement in 1985. This exit was perhaps timely for, the following year, the Post Office was reorganised into three separate businesses: Royal Mail Letters, Royal Mail Parcels and Post Office Counters. Telecommunications had already split, having become fully privatised in 1984. It was in 1986, also, that computers were first used at North Road. Nineteen years after retirement, Harry Bennett remains affiliated to the organisation as Honorary Treasurer of the PO and BT Pensioners (Brighton branch). He affirms the advantages of the Post Office’s career structure as he experienced it. Gradual progression through the ranks resulted in a sound understanding of the organisation’s workings, with a growing loyalty. Promotion was largely based on merit, and the ultimate outcome was an interesting, varied career with a pension to look forward to. I am in Canberra Australia visiting my son and viewing this website on Brighton because this is our home town. Noticing the name Harry Bennett I said ‘Your Dad had a mate called Harry Bennett’ and sure enough there you were. My husband was Dennis Guy and I’m Sylvia. I believe Dennis and Harry were mates as boys living in the Kemp Town area. Dennis was also on the Post Office and climbed to be an Assistant Inspector. The photograph of the Transforma was so interesting to my son who had heard Dad talk of it. Dennis left in 1967 to come to Australia. On his last day at the PO he spent 20 pounds on bottles (a week’s wage) and I understand a good time was had by all in the recreation room. Sadly Dennis passed away in 2003 and, at his own request, was cremated and his ashes sent to England for his brother to scatter on the Downs near the windmill at Rottingdean where he was the only telegraph boy from 1945-1947. Best wishes to you Harry. The Transforma was placed in the Silver Spring, Maryland, Post Office (Blair Branch) in 1957. I was the first operator to qualify for the Transforma and was given the key of AA. Postmaster Arthur Sommerfield was given the first key: AS. We sorted an average of 50 letters per minute per employee and were given airtime for our achievement on national television. I was a telegram boy at Ship Street from 1970 until 1972. It was a wonderful experience. I have now obtained an old BSA Bantam motorcycle which came in new in July 1971, one of five machines to replace the old worn out D1 models. I am currently restoring it to its full GPO livery. It is the only survivor of this model to come to light so far. I have a large collection of photos of the telegram boys taken in the 1960s and will try to put them up here. Did this Harry Bennett ever live at 9 Knap Close, Bevendean and has he got a sister called Joan? It was Ernie Bennett, cousin of Harry Bennett, who lived at 9 Knap Close. Many thanks to Viv Webb for the information about Ernie Bennett. Could you tell me if Ernie is still alive and would you have any contact details for his sister, Joan, please? Many thanks. I did so enjoy reading about Harry in Brighton Man of Letters, it was very well written. It brought back so many memories. Good to see him wearing his UPW badge. I started as a boy messenger in 1966 in Worksop, they wouldn’t trust us with a Bantam, only a pushbike! Good old GPO. Hello Harry, Just wondered if you may remember my late grandfather Cecil Wiseman (born 1892). He was also a messenger boy for the Brighton Telegrams etc. He worked there all his life until retirement in the late 1950s or early 1960s. I think there may have been a Wiseman/Bennett marriage at some time. I was a messenger in Manchester from August 1961 to July 1965. started on push bike duties but graduated to riding a 125cc BSA Bantam.to cut a long story short they were great days and ones that I will treasure for the rest of my life, I will try and provide a story of my telegram boy days. I have obtained a brand new old stock 1936 telegram boys jacket and cap along with the badge no. T3, trousers, belt and pouch from good old eBay. If harry would like to come and try it on. if he can squeeze into it for a photo he is welcome to sit on my 1971 GPO BSABantam that was used at Ship Street Brighton from 1971 to 1974 when taken out of service and sold off. I was a telegram boy in 1952 until 1954 in Mebourne. We worked from Little Bourke street just up from Elizabeth St.
We often rode those heavy bikes out into the surrounding suburbs on the night shift. The latter part of my time was spent in circulation in the building opposite (5th floor). Wonderfull memories, Iwould love to hear from anyone who worked there in those times. Tatts winners were notified by telegram in those days and there were many stories on how the lucky or unlucky boy fared. Did Harry Bennet have a wife by the name of Vera and lived in the Moulescoomb area? A Harry Bennet lived above me in Oakendean flats, Moulsecoomb Way in the 1960s and 70s. Could this be the same man? My grandpa, Jack Bennet, used to tell me stories about his uncle, Harry Bennett, and how he used to be connected to Henry Ford. Don’t remember as much as I would like to but I do remember one – my grandpa said he came to visit one weekend so it was supposed to be, but Uncle Harry and his family were only there for a few hours before he got a phone call and within minutes he had packed up and said ‘sorry, but I got to go now’. Wish I was older and my grandpa was still alive cause I would have a lot more questions. Re Jack Bennett, I’m afraid you have got the wrong Harry Bennett. None of my family were called Jack that worked in the Post Office. My father did, his name was Robert but always known as Harry. Message to Lisa Ingham. Afraid not I’ve never lived in Moulescoombe Way, also my late wife’s name was Gladys. Just found this page again. Gladys passed away on April 2005, two days after her 79th birthday. We had 56 and a half years together. Best wishes to everyone.